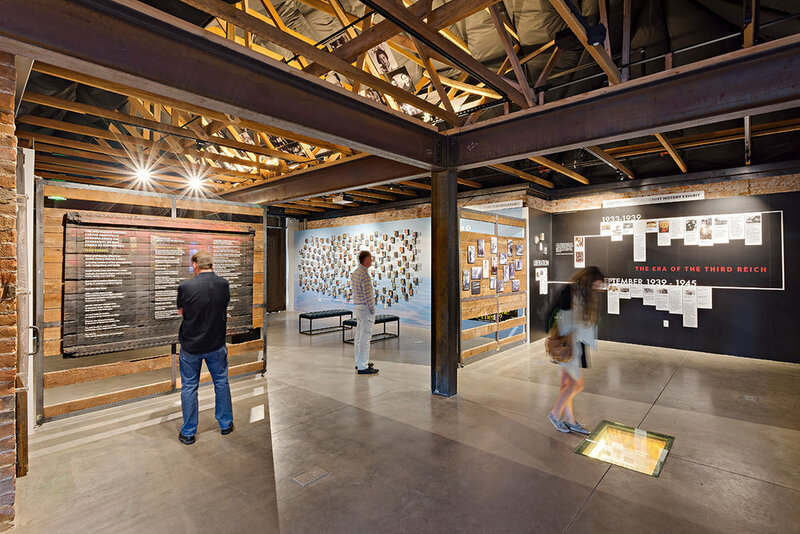 The Holocaust History Center, located inside a historic home next to Tucson's first Jewish Temple, is exhibits the history of the Holocaust through the eyes of the local Tucson survivors. For this project, Tectonicus oversaw the design, fabrication, and installation of all interior galleries and the exterior Contemplation Space. Working with the director and artist Wylwyn Reyes, the design process engaged the curation of the galleries as a starting point to designing the flow of the exhibits and casework that encompasses them. The exhibits were designed to fold up into the walls so that the space can be used to hold events and gatherings. The open air Contemplation Space, intended as a space of quiet, solitary reflection, accessed through a large, custom sliding door with a serrated steel hand grab, embodies that dark and complex history of the holocaust and concentration camps. This was a full design-build project, with Tectonicus Constructs overseeing the construction of all interior spaces.